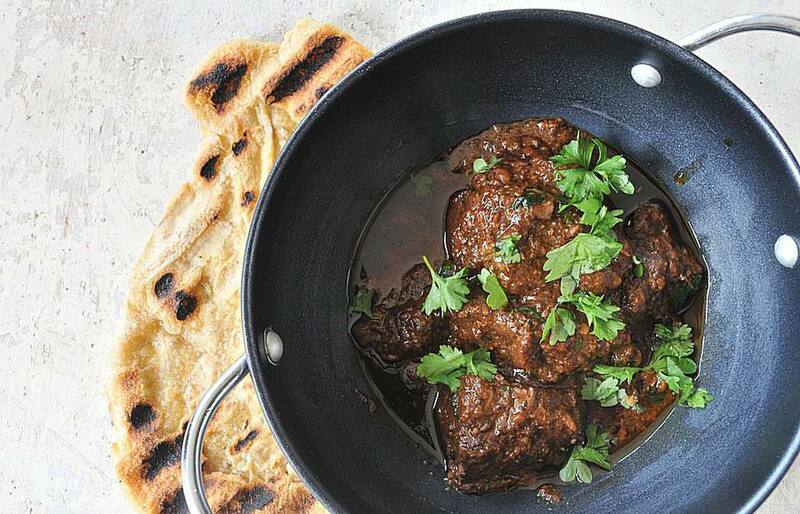 This Moroccan spiced goat stew recipe gives a wonderful, warm spicy flavor to the tender chunks of meat, and when served with flat breads or simple plain, boiled rice makes a wonderful autumn or winter supper dish. Don't be deterred by the large number of ingredients in the recipe; It's actually quite easy to make but requires a little planning for the marinading and long slow cooking, so perhaps best to start the day before. Gather the ingredients. Mix all the spices including the Ras al Hanout together in a small bowl. Heat a large frying pan, sprinkle spice mix in and cook for one minute, shaking the pan constantly and taking care not to burn. Once cooked tip the spice mix into a screw-top jar and put to one side. Dry the shoulder pieces with a little kitchen paper, place into a bowl, add the yogurt, mint, garlic and stir well. Cover with a tea towel, place in the fridge and leave to marinade for a minimum of three hours, even better, overnight. Heat the butter and 4 tbsp. of the oil in a heatproof casserole dish, add the onions and cook gently for 5 mins until soft. Add the ginger, 3 tablespoons of the spice mix from the jar you made earlier, and stir, add the tomato paste and stir again. Remove the meat from the marinade onto a plate. Reheat the casserole dish on the stove, add the remaining oil and once hot, add the shoulder meat and fry for several minutes until the meat is lightly browned. Pour the sauce over the meat, bring to the boil and cook for 5 minutes. Cover the casserole with a lid and place in the middle of the preheated oven. Cook for 4 hours, stirring occasionally and making sure the meat is always covered with the sauce. If the sauce is drying up, add a little boiling water and lower the heat. After the 4 hours, remove from the oven, the meat should be soft and tender (if not, return to the oven for a little longer). Check the seasoning and leave to stand for ten minutes. Before serving, chop the coriander and add to the stew. Serve the stew with grilled Moroccan flatbreads and or/ plain boiled rice to soak up the lovely sauce.